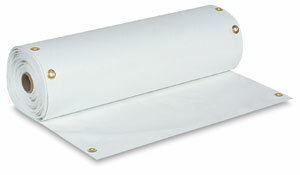 Banner material is perfect for doing it yourself and far less expensive than custom ordering. Dispense the exact amount you need; grommets every 24" make it easy to secure. No waste! 11.5 oz. vinyl accepts screen printing inks and paint. Hemmed edges offer durability and strength. 3 sizes; 4 colors.